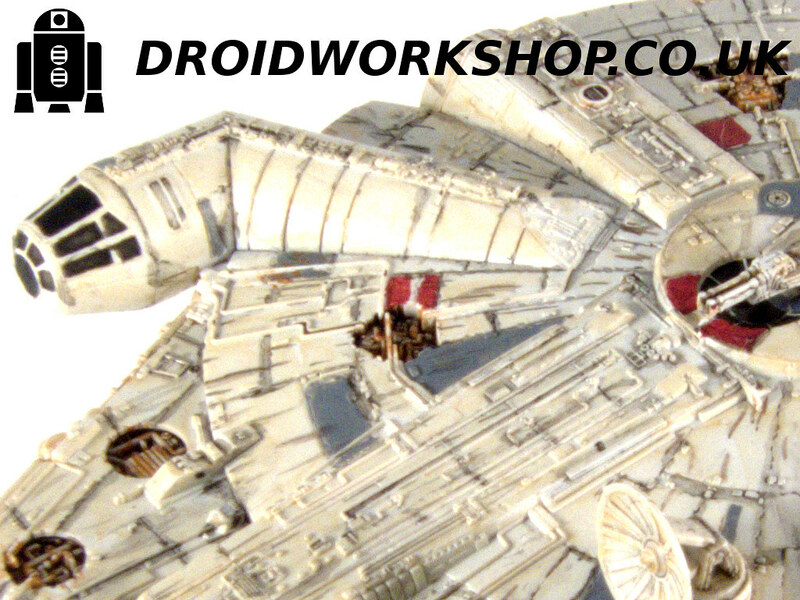 The Star Wars Millennium Falcon Bandai Vehicle Model 006 is now complete! Last year, I spent a portion of my lunch hour each day building the Metal Earth Star Wars models, rather than browsing the internet, (or worse continuing working! ), but quickly completed all of those that I liked and were available. This left a bit of a hole in my day, and I wanted something to fill the gap. I’d always fancied building models during my lunch hour, but have been put off by considering the hassle of transporting the model or tools back and forth from work. I had been collecting the Bandai Vehicle Model series (or “stockpiling” might be a better term) for a while now, and they seem particularly suited to lunchtime building as the models are small, simple and quick to create. I’ve already built and completed one of the series, Poe Dameron’s X-Wing which I thought was good fun and I was impressed at how well it went together. I wasn’t exactly thrilled with the inclusion of stickers over decals, but given it’s size, I can sort of understand why they aren’t included. The next one I fancied building was the Millennium Falcon. This is my absolute favourite movie model without a shadow of a doubt – I have numerous versions of model kits to build of this ship, including two vehicle model series boxes (yes, I bought a duplicate). Given I had two, the “hobby fear” wasn’t going to hold me back from starting one. It’s been a busy start to the New Year at work as I expected, and things have got a little busier this week with another project also for the end of January that I need to manage. That’s pretty much wiped out my intended painting efforts for the next few weeks! Todays the first day in a couple of weeks that I’ve had to actually get any painting done at all, although last week I did do a little cleaning up of the A-Wing panel line scribing to get it ready for painting. Although I’ve had a little painting time this week, mostly it’s been spent on practicing blending, glazing and feathering techniques on the Blood Claw. This takes a while, and doesn’t show up well enough on camera, so I’ve not posted anything about it. He’s very much turned into more of a test model. I think there’s a small chance I may just figure out how to smooth out transitions better with a brush, which means I may relegate the airbrush down to undercoating and basecoats, but that may be getting well ahead of myself hahaha.